Summer weather is here. With it come breakfasts enjoyed in a warm breeze. Afternoons of lounging in the sun. And evenings chilling with a glass of wine in hand. Whether your outdoor living space is just beyond the balcony door on a terrace above the city or in a lush green garden with a pool, here you will find the best outdoor lounge chair for your needs. This selection of products offers something for every taste, from conceptual and sculptural designs to versatile chairs you can also use indoors. The Aito Lounge Chair provides the perfect solution to relax, wherever you want to go. Conveniently lightweight but also flexible, this chair is easy to fold and throw in the back of a car. Next destination? The seaside, your summer cabin, or the park. Designed by Elisa Honkanen, Aito brings together the traditional minimalism of Nordic design along with function. It features a weather-resistant teak frame as well as a comfortable padded seat and backrest. With its distinctive pear shape and vibrant colors, Innit’s Acapulco Chair made waves when it made its debut in 2009. Nine years later, and this chic design adorns outdoor living spaces around the world. It provides ultimate comfort without the need for plush cushions. The seat features a colorfast and UV-resistant woven vinyl cord that doesn’t get hot in the sun and allows air to flow freely to keep you cool while you relax. Both the vinyl cord and the powder-coated steel frame are weatherproof and durable to ensure that you’ll enjoy this chair for years to come. 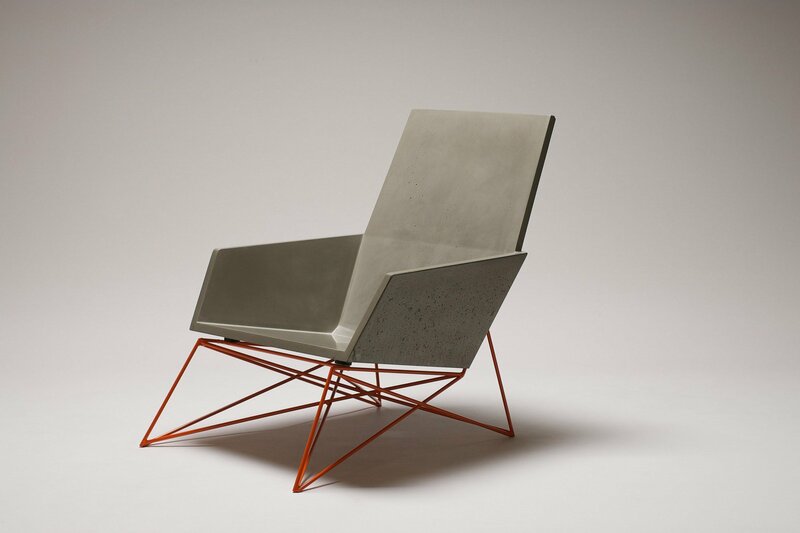 To top it all off, the Acapulco Chair is also handmade in LA and Toronto. Designed by Konstantin Grcic for Italian company Mattiazzi, the Medici Chair refines the classic Adirondack to provide a stylish outdoor furniture solution. The chair has a low-slung and semi-reclined design, offering extra comfort while lounging in the sun. The solid ash wood features a heat-treatment and hand heat-oiled finish, which means that this gorgeous chair will withstand the elements in style and look fantastic for years. Italian design often defies the norm. The InOut 856 chair is a great example. Designed by Paola Navone, this outdoor seating creates a focal point with its woven pattern and simple, tubular frame. Elastic belts intersect to provide comfort and perfect support on the backrest and seat, while the aluminum frame keeps the chair as lightweight as possible yet durable and sturdy. Available in gray, blue, and black with matching frames. The best outdoor lounge chair should look at home both by the pool and in a living room. The Bay Lounge Chair achieves this feat thanks to its elegant design. Created by Henrik Pedersen, the chair displays the designer’s preference for formal clarity and versatile style as well as premium materials. The teak frame boasts eye-catching angles, while the plush upholstery with a canvas fabric guarantees maximum comfort. All you’ll need to do is sit back and enjoy the sunshine. A sculptural take on lounge chairs, Maarten Van Severen’s MVS Chaise adds a stylish accent to any outdoor living space. It’s an iconic piece of furniture that stands out anywhere with its minimalist design and distinctive shape. More than just eye candy, this recliner offers excellent comfort. Its pliable frame adapts to the weight and shape of the user’s body while also allowing an easy transition between sitting and reclined positions. A must-have for design lovers and those who love to lounge in style. A modern and sophisticated twist on the original Adirondack chair, Muskoka features an elegant and thoughtful design. The hand-cast shell and the hand-cut and welded steel base will patina over time to gain more character. Apart from its appearance that complements any modern outdoor space, this Hard Goods chair also focuses on ergonomics and function. The seat boasts a cast-in copper drain opening, while the base is conveniently removable. Custom Muskoka foam covers enhance comfort further and add a pop of color to the refined chair at the same time. 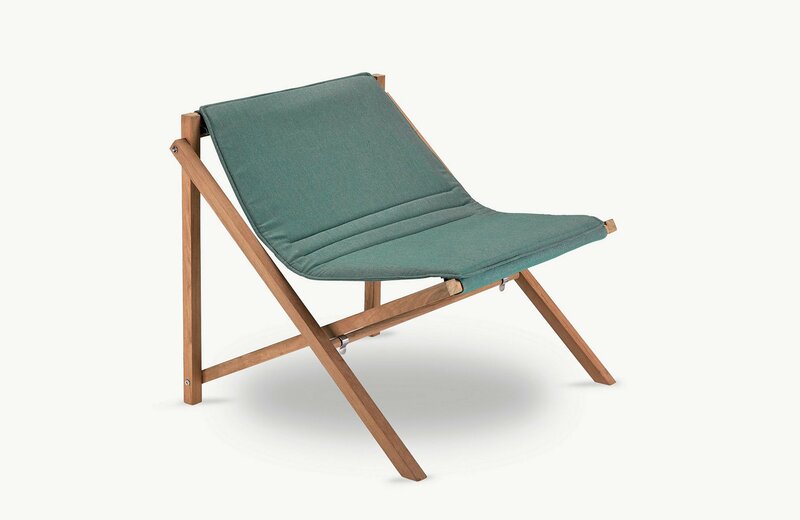 Perhaps the best outdoor lounge chair for movie buffs and those who appreciate good design. Referencing the iconic director’s chair design, Takeshi Nii’s Ny Rocking Chair refines the familiar silhouette for modern living spaces. The minimalist aesthetic reminds of the designer’s Danish heritage, along with the word Ny, which means “new” in Danish. Above all, the chair is designed with comfort in mind. It features a canvas hammock-style seat and beech wood armrests. The stainless steel frame is not only lightweight, but it’s also easy to fold and carry around. Which makes the Ny Rocking Chair perfect for relaxing wherever you feel like it, rain or shine. In a similar way to Nils-Ole Zib’s other products, the Nozib lounge chair explores the concept of “less is more” with a minimal, clean design. Two arched elements come together in a perfect balance to create the seat and backrest. Made of 88 teak parts, this outdoor chair withstands both hot sunshine and cold rain, preserving its good-looks intact. The chair also folds easily, providing a convenient way to move it from the garden to a terrace or back in storage. A versatile design that looks good virtually anywhere. It doesn’t get more “designer furniture” than a chair inspired by the mid-century modern aesthetic. And the IDV Cord Lounge Chair is a great example, as it reminds of the string chairs of Southern California, circa 1950. Made from vinyl cording and powder-coated steel, this chair will handle any weather conditions and look great at the same time. Comes in various colorways, to complement any outdoor living space. One of the best outdoor lounge chair designs for mid-century modern fans.